In one marked particular, church building of the present day differs from that which was carried on formerly, and that is in the gradual manner of its execution. Twenty or thirty years ago, when a church was begun, the great object was to complete it as soon as possible, and to provide accommodation for a certain number of sitters. The money granted or subscribed for this object was applied to the erection of the whole structure, which became simple or ornate in proportion to the amount of funds available. At the present time it is not at all uncommon, when means are limited, to begin by building the chancel, and even to enrich it and decorate it before the rest of the building is complete. This has happened with two of Mr. Street's churches/viz. that of All Saints', Clifton, and St. John's at Torquay, both admirable specimens of his ability. 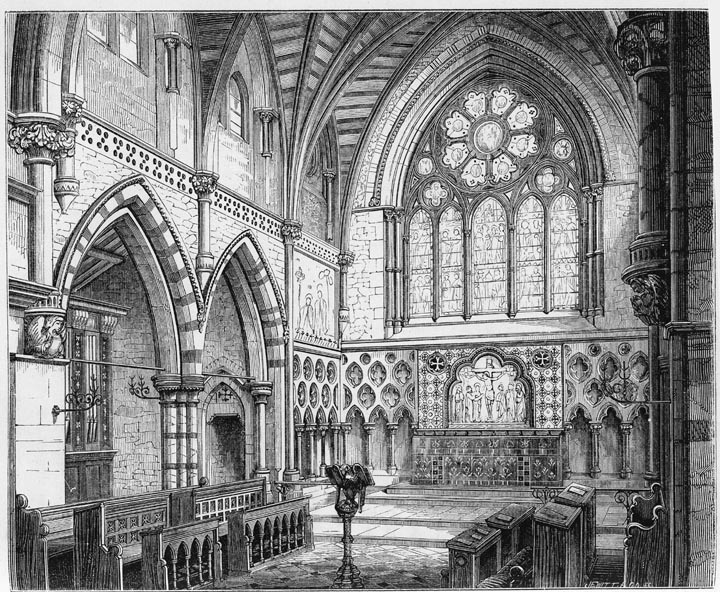 The chancel of All Saints' is decorated internally with stone of three different hues — white, bluish gray, and light red, judiciously apposed in the construction of the piers, &c. With such fair building materials as these but little carved work is necessary, and to a critical eye the perpetual notching of the arch edges throughout this church appears tedious. There is no type of ornamentation more mechanical or less interesting in itself than this notched work; and so much thought and ingenuity have been bestowed on the building that one is impatient of details which exhibit neither, and have, moreover, been woefully hackneyed elsewhere. The chancel screen is an instance of Mr. Street's luxuriant fancy when let free to play with brass and iron, but its elaboration is cleverly concentrated on the upper and lower portions, leaving the centre a plain transparent grille of octagonal roofs.